Fabulous! Every illustration is a delightful search for dinosaurs hiding in the most ordinary of household items such as laundry baskets. Great! We loved this, my boys were fighting over who could identify the next dragon and what it was made of. The ending was funny and unexpected. My six year old son enjoyed reading the book and finding the hidden dragons. Thanks to this book, everytime is look into a cloudy sky I look for dragons...they are always there! 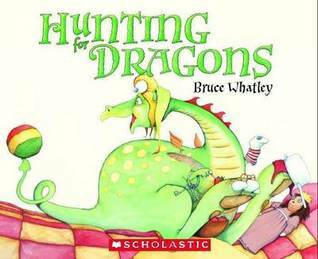 Bruce Whatley - Bruce Whatley is one of Australia’s best-loved and most-respected author–illustrators. His most recent books include the enormously successful and award-winning Diary of a Wombat, written by Jackie French, and its companion volume, The Secret World of Wombats, also illustrated by Bruce. The best selling team have also collaborated on Pete the Sheep, and most recently, Josephine Wants to Dance. Two of Bruce’s previous books, The Ugliest Dog in the World and Tails from Grandad’s Attic, were named as Notable Books by the Children’s Book Council of Australia in 1993 and 1996 respectively. Looking for Crabs was shortlisted by the Children’s Book Council in 1993 and Detective Donut and the Wild Goose Chase was named an Honour Book by the Children’s Book Council in 1998.